In the last few years, good running form has received a lot of attention. While movements like minimalism and Chi Running hold out hope that their techniques will prevent injuries, or help them finish faster, experts have concluded that there's not enough evidence to say that any particular school of running form offers the miracle cure or the magic bullet. Maintain a short, quick stride. Try to keep your feet under your torso. Avoid lengthening your stride by reaching forward with your foot. Overstriding can lead to injury. Make sure your foot strikes under your knee, not in front of it, which can lead to injury. It doesn't matter whether the heel or forefoot hits the ground first, as long as your foot is not in front of your knee. This is especially important when running downhill. Keep hands loose and below your chest. Make sure your hands don't cross your midline and your hands don't punch forward, both of which can throw off your gait. Pay careful attention to this when you're carrying something like a music player or a dog leash. Switch hands halfway through the workout if possible. Avoid looking down or to the side, which can throw off your gait. Keep looking straight ahead. It's easy to tense up non-running muscles—especially when you're struggling to stay on pace—and that saps energy your body needs to run. When the going gets tough, do a body scan: release tension in your eyebrows, jaw, and fists, and bring your shoulders away from your ears. 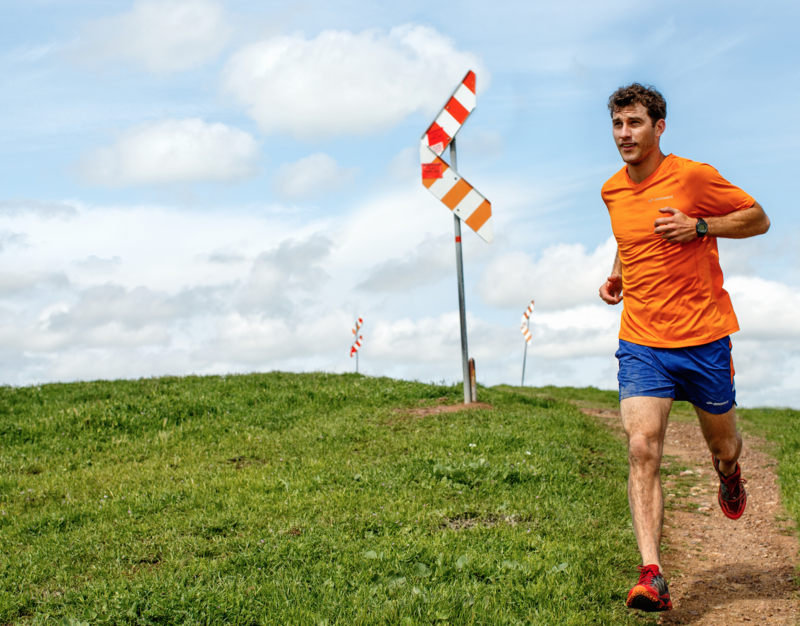 When you're running uphill, keep your head and chest up, look straight ahead, visualize the road rising to meet you, push up and off the hill, springing from your toes, and avoid bending at the waist and hunching over. 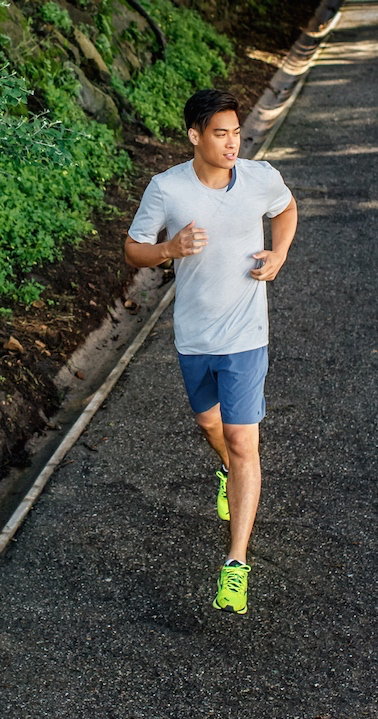 When running downhill, keep your torso upright, look straight ahead, visualize "controlled falling," keep your nose over your toes, step softly and don't let your feet slap the pavement. And remember: any time you change anything about your running - your form, the surface, the shoe, the distance, or your pace - you've got to give your body time to adjust. The muscles, bones, and joints adapt to change at a much slower rate than the aerobic system. So even if you're running the same distance you have been, introduce any changes gradually. If you do change your form, cut back the time you spend working out and the distance you cover to you give your body a chance to adjust.